Our firm hold matte Pomade for sale in USA has Beeswax and Lanonin and can make you look handsome in no time. The hold will be good & the texture that it will add looks awesome. It would give you a natural look and you will prefer using it all the time. Just take little of it, rub it on your palms and apply on wet or dry hair. Comparing this to any of the old products I used to use (Axe, got2be, Dove and many others), the difference is night and day. 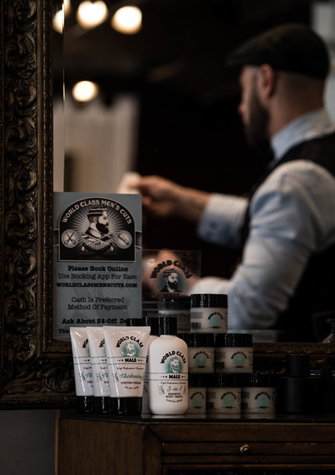 It is true quality and works so well, that when I first tried in the the barber shop, it was obvious that this would be my new go-to hair product. This is super light and, at night my hair looks exactly the same as it did in the morning when I put it on. I've never used anything that holds this well and looks like there's no product in your hair. Would highly recommend it. As someone with unruly hair, I've been searching for a product that actually keeps it in place throughout the day. Having tried a number of well-known products that didn't hold up (American Crew, Suavecito), I decided to check out World Class Male. It's amazing to find a firm hold pomade that works as advertised. Going through a windy day without my hair blowing all over the place is a pleasant experience. 100% recommended.